Luke Gale, back in the swing of things for Castleford Tigers. 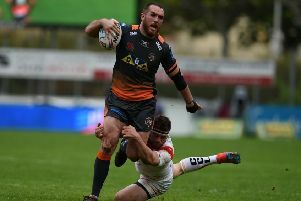 Castleford Tigers boss Daryl Powell is pleased to see a developing combination between his attacking playmakers Luke Gale and Peter Mata’utia. With half-back Gale being out injured for much of the season and Mata’utia a late recruit from Leigh in the full-back position they are still learning about each other’s game. They have only played three games together so far, but Powell is encouraged by their combination work. He said; “I thought Galey played well at the weekend, created some opportunities and it’s just about building some combinations, particularly him and Peter making sure they’re tuned in. “I thought they were showing really good signs of working well together. It’s just good to have Luke back out there. “Peter has been outstanding since he came in.